I feel kind of silly even posting this because it really isn't much of a recipe. It is more of an idea that brings together just a couple of ingredients. But a classic pairing it is. 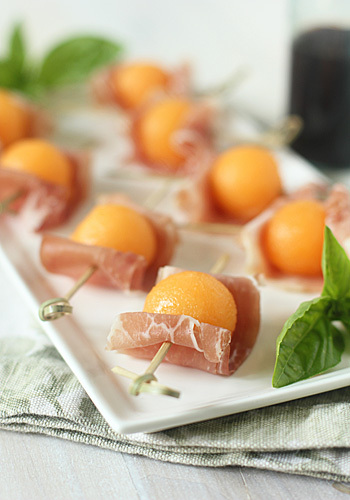 I enjoy the simple combination of the sweet melon and the salty prosciutto, but other ingredients can be added for flavor enhancement. Basil lends a freshness to the proceedings while the balsamic vinegar brightens up the flavors. I have even seen it served with mozzarella cheese. The most important thing to remember is to use quality ingredients. The melon should be at its peak in flavor and texture and the prosciutto should be the best you can find, preferably Prosciutto di Parma. And if you decide to serve it with the vinegar, an aged balsamic works best. It is sweet and syrupy. This little amuse-bouche is on my Can't go wrong with this list for appetizer ideas. On a cutting surface, slice the melon in half. Using a spoon, scrape out the seeds and discard. Using a 1-inch diameter melon baller, scoop out as many balls as you can, about 18 balls per each melon half. Working with one piece of prosciutto at a time, cut the slice in half lengthwise. Fold each half in half lengthwise. Skewer the top half of the folded piece of prosciutto onto the skewer, then skewer one cantaloupe ball and finish with bottom half of the prosciutto. Transfer to a serving platter. Repeat with the other half of prosciutto and the remaining prosciutto and melon balls. Serve with fresh basil and a aged balsamic vinegar. LOVE serving this here in spain. so yummy!! A perfect pairing of which we need to be reminded. Thanks for sharing! What a lovely appetizer, and compliment of flavors! I would recommend making it just before serving. The cantaloupe would make the prosciutto soggy if made to far in advance.